With all the baking thats going on in the UK at the moment it seems like a good time to get on board with healthier options. Carrot cake gets all the press when it comes to cake baking, here we use beetroot maximising the earthy flavour and awesome colour that it gives out. The individual muffins help me in the restraint department. When we make a big cake I just keep carving ‘carpachio’ slivers off until the cake has disappeared. Individual cakes helps me display a modicum of inner strength, convinicing myself that one is enough. If you don’t have muffin cases then use baking paper New York deli style. Suitable for gluten free. Preheat the oven to 180 degrees centigrade. Lightly oil the muffin tin and put a paper case in. If you have a silicone muffin tin, there is no need to use cases. Take a mixing bowl and mix all of the dry ingredients. In a seperate bowl whisk together the eggs, oil and vanilla. Fold the two together. Stir in the grated beetroot and the zested orange. Spoon into the prepared muffin tin and pile nice and high, so that the muffins will rise above the line. Put into the oven and bake for 25 to 30 minutes, until a nice golden colour on top and an inserted wooden skewer into the centre of the muffin comes out clean. Leave to cool completely in the tin. 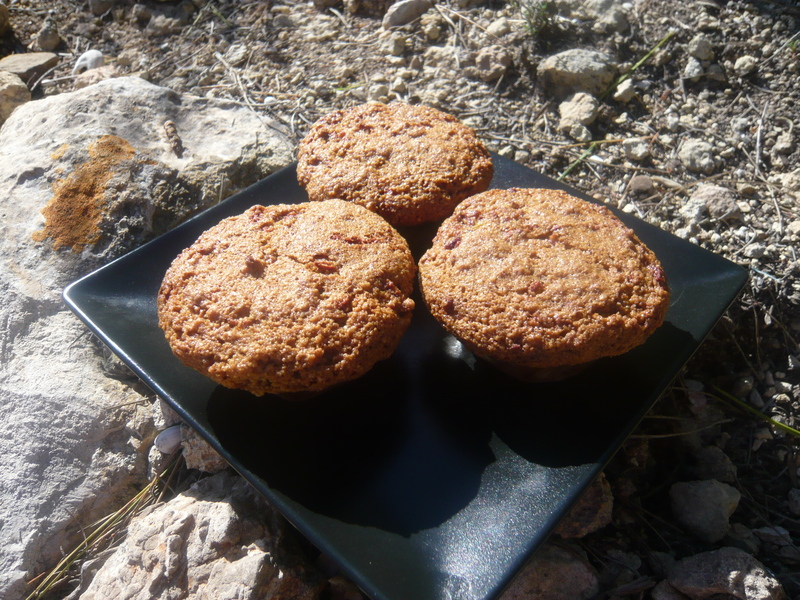 This entry was posted in Beetroot Muffins and tagged almonds, beetroot, cinnamon, gluten-free, muffins, no butter, orange, vanilla. Bookmark the permalink. i’m biased. my first weekend job was working for a greengrocer, and part of my job was cooking the beetroot in an old washing “copper”. the smell of cooking beet in the old shed out the back still lingers. (and that was approx 53 years ago!). of course your cooking is so good that maybe i can be persuaded. i liked your beetroot with orange zest, so maybe i’ll be able to gently start re-habilitation. i can also manage beetroot leaves in salad. it worked with whiskey. i frightened myself badly with whiskey in college. i have managed to come to terms with it 50 years later via the single malt whiskey route. my best pal from college still can’t touch gin by the same token and no amount of hendricks with cucumber will persuade him. the paper starts now with a vengeance, and i’m painting the boat, so i don’t know when i can return and relax on the terrace. on and up with the blog.